Leave it to America's Test Kitchen to help you get a perfectly scaled dinner for two on the table--no guesswork required. Whether you're in the mood for a takeout-inspired stir-fry or a more refined beef tenderloin, you'll find recipes to satisfy everyone's tastes. To scale down our favorite dinners to serve two, we've reengineered 75 recipes from the ground up, using ramekins to make individual Chicken Pot Pies and blade steaks instead of chuck to produce a streamlined Yankee Pot Roast. 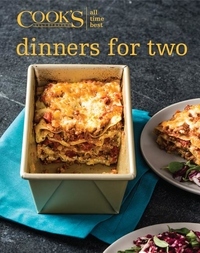 From easy weeknight options (Teriyaki-Glazed Steak Tips and Skillet Pork Lo Mein) to date-night-in meals (Honey-Roasted Cornish Game Hens and Shrimp Scampi), hearty meatless mains for vegetarians (Baked Manicotti and Soba Noodles with Roasted Eggplant and Sesame) to comforting Sunday dinners (Beef Stroganoff and Chicken Piccata), All-Time Best Dinners for Two offers options for any occasion.